Gen Y The Greatest Generation – Seriously? According to some psychologists who have analyzed results of the most recent American Freshman Survey, which has been asking students to rate themselves compared to their peers since 1966, the survey shows that present U.S. college students feel more entitled than ever and that there is a disconnect between students self-assessed value and their actual abilities. The issues of Gen Y thinking they are the greatest generation were discussed among a news commentator and panel that included noted “Gen Y Guy” Jason Ryan Dorsey. Listen to the discussion for yourself. What’s your opinion / experience? Born between 1981 and 2000, also known as “The 9/11 Generation” and possibly “Echo Boomers”, this generation is now in the workforce, and the second half of the generation is entering college. FOX & Friends News interviewed a Florida college professor on the results of a class project about – The American Dream. As noted, the results are jaw dropping! How will this generation of library customers affect the future of librarians, and libraries? Please ignore the political overtones of this news piece, because politics is not my purpose or point in posting this. It’s about the impact in libraries from this generation of library customers. In case it hasn’t become evident already, I’m a Baby-Boomer. So is my wife who was my high school sweetheart. We were both raised in Middle America with traditional values which we adopted – get educated, work at a career, own a house and two cars, support your local school and church, enjoy the American Dream. In the definition of the American Dream by James Truslow Adams in 1931, “life should be better and richer and fuller for everyone, with opportunity for each according to ability or achievement” regardless of social class or circumstances of birth. Anyway, the American Dream also included a good steady job which was secure (if not enjoyable), traditional family values, and “things” – cars, boats, color TVs, golf clubs and country club membership, community and social activities including civic clubs and churches – along with grand kids, retirement, etc. A less proclaimed element of this American Dream was that one’s children would have more and better than their parents. The children of the Great Generation were ‘encouraged’ to go to college and become a professional something and try to make more money than their parents. The children of Baby-Boomers were ‘expected’ to go to college, maybe graduate school, and have better careers and make even more money than their parents. The children of Gen X were expected to ??????? This is where the American Dream began to break down, or at least change to something else – just what is the big question. We’ve already seen that many children of Boomers are back home living with Mom & Dad because the economy is in the crapper, jobs are scarce, careers are indeterminate, employment is unstable, creative young people are taking their college fund and doing something else with it, families are fragile and less permanent, and a myriad of factors have been instrumental in altering that original post-Depression Era American Dream. This may seem like a long way around to my point. But, a serious understanding of the “ownership” culture, and its demise is essential to understanding an “access” culture. Previous generations expected to own “things”, whether as a simple convenience to enjoy, or as a status symbol for some. Ownership was the only thing previous generations have known. We’re so much moviephiles that we often respond to conversation with movie quotes, and we can pretty much quote whole sections of our favorite movies back and forth. We have a DVD collection of about 50 of the 83 Academy Award Best Picture winners, out of a total collection of 300+ DVD movies (and a whole bunch of VHS movies not yet produced or affordable on DVD). You have to realize that this collection goes back to the days well before Blockbuster and Hollywood Video, and even before libraries began to develop a media collection. (Holy Cow!) So, “access” was not a natural or economical vision of the future. Thus, we Baby-Boomers have begun the transition from our deeply ingrained “ownership” culture to an “access” culture. So far, this “access” situation has shown only advantages. It is hard to find any fault with 24/7 access to our favorite movies we don’t own (assuming uninterrupted Internet service, which is pretty much a sure deal these days since I can’t remember the last time our service went down), or at least get the DVD within two days. When we move next time, and hopefully to our retirement (dreams Die Hard with a Vengeance) location, we will have fewer “things” to pack and move – possibly only the Best Picture award collection (some habits Die Harder). Even though there is an anxiety that goes with attempting to rely on “access” after being raised in an “ownership” culture, as I sit here typing and listening to The Beatles classic “Let it be” on YouTube, I now have a better appreciation of the “access” culture that borders on respect. Gen Y and Gen Net young people take “access” for granted, and the totally 21st Century generation may never understand “ownership”, because they expect “access” to become better and even more accessible – continuous mobile connectivity. I’ve been saying for some time that the conditions of change are different this time. Let me state unequivocally that this is NOT a political commentary. I am simply illustrating a comparison between my views on the external factors influencing the librarian profession and world events. … the paradigm shift we all discussed 15 years ago … was a result of the introduction of the Internet and WWW into the average American office, university, school and home. That shift was essentially about delivery of library services. There wasn’t much change in philosophy of library and information science, but it changed delivery of library information from on-site to on-line. The concern that the WWW would replace librarians was exaggerated and didn’t materialize, because we retained our role as “information specialists” who knew the How and What of information retrieval and evaluation better than others. Everything evolves, from card catalogs to OPAC, but that shift was mostly about delivery. Today, youth and technology are the reasons that the librarian profession will be changed forever. Youth who are being educated with information, communications and technology literacy will have the capabilities that their parents did not to do their own information searching and selecting. Technology that youth are growing up with that their parents did not have will provide more information, more access to it, more choices of information providers and more information format choices than ever in history. Are you ready to acknowledge and embrace the changes that youth and technology are causing in the librarian profession? The absolute total purpose and focus of the 21st Century Library Model is the customer. Customer centered library services that meet the information needs of the 21st Century customer will result in any library remaining relevant to its community. This premise includes an expressed challenge – knowing your 21st Century customer. The 21st Century customer is NOT the 20th Century patron. The 21st Century customer should be considered “new” – the Millennial Customer – if you will. World renown management expert Peter F. Drucker is the originator of the idea that the customer is the purpose. Public libraries have been slow to figure out that the 21st Century customer does not need 20th Century library services. School, academic and special libraries have been dealing with the new Millennial Customer for several years. Unless we want to see brick & mortar libraries go the way of the rotary dial telephone, the transistor radio, and the cathode ray tube, we need to understand the Millennial Customer and adapt library services to meet their interests, because they do not appear to have library service “needs”, and may not seek services from public libraries! This segment of library customers includes the Greatest Generation and Silent Generation, those customers over 65 and who can generally be considered 20th Century customers. Their interests are typical of 20th Century library services – books, newspapers, leisure and recreational print material, a quiet place to read and socialize. Most are not Digital Immigrants, but those who are use a limited amount of technology by necessity, like Internet and email. This segment of library customers begins the serious Millennial Customer who has adopted technology into their lives – work and leisure. They are the Baby Boomers who are just this year turning 65, and are probably more of an enigma than the other generations, because they span a broad range of background, interests and activities. In middle age, they realized that they needed to become “life long learners” because their high school education wouldn’t get them very far in the last 20 years of the 20th Century. Technology was changing so fast that they had to learn it to keep up and retain their place in society and the workplace. As library customers, Boomers represent virtually all library services, traditional and cutting edge. Older Boomers are Digital Immigrants by necessity more than desire, and they have typical traits of Digital Immigrants in that they still use punctuation in their emails, IMs and even tweets. I place this discussion of GenX in the Digital Native category because this is THE generation that has truly mastered the art of adapting to change. They have straddled today’s technology in an amazing way, yet still remember being their parents “TV remote”. Their first introduction to technology was sitting on the floor in front of the TV and changing the channel, and now they proficiently handle the five remotes on the coffee table in their home, or more likely figured out the “universal” remote. Generation X people are mostly Digital Immigrants by birth, and for the most part represent those now reaching middle age. GenX statistically holds the highest education levels when looking at age groups. Because the technological, educational and societal changes have been so significant between their own childhood and now their children’s, none of the Baby Boomer models fit for the GenX generation. They must reinvent everything from parenting to career paths without a model. While GenX is often called the “microwave generation” due to their desire for instant gratification, they still struggle with their children who sit in a home with three different gaming systems, multiple computers, and 500 TV channels, and complain that they’re bored. GenX work in the vice grip of two generations. One that has stayed in the work force longer than expected, and therefore created a bottleneck in upward mobility. The other generation with better technology skills is breathing down their necks, with their over-indulged upbringing, where everyone who participates gets a trophy, and wants everything yesterday. Since most GenX did not grow up with technology (as we understand it today), but were exposed to it early in their late teen and early adult life, and have that uncanny adaptability toward technology, many could qualify as Digital Natives, but are still technically Digital Immigrants. Fortunately, they did not acquire the aversion traits of their parents regarding technology, so they can all be considered Digital Natives in their behavior. Generation Y (considered to be born from 1982 through 2001) are so labeled as a follow on to the previous Generation X, but self labeled as Millennials (wanting to disassociate themselves with the previous GenX). Most distinctively, they are indeed a “new” generation of learner, consumer, citizen and library customer – the Millennial Customer. Millennials are typified by their use of instant communication technologies, are also somewhat peer-oriented (which means they prefer the opinions of anonymous peers to that of “experts”), are into self-expression and acceptance, are more culturally tolerant than previous generations, have an inclination for delaying some of the rites of passage into adulthood, and trend toward living with their parents for longer than previous generations. They are generally considered the “Trophy Kids”, due to the “everybody’s a winner” approach to group activities, and as a result tend toward generational consensus building. They like to work collaboratively, and prefer to shape their jobs to fit their lives rather than adapt their lives to the workplace. They also believe in “doing” as opposed to “learning to do”. Jason Ryan Dorsey, The “Gen Y Guy” presents an awesome overview of the Millennial Generation. Here is another perspective of the Millennials from themselves. This is the generation public librarians should focus on and study, not because there are 60+ million of them, but because they are such a different consumer that in order to address their library service interests, public libraries will have to understand them, and literally take services to them. (School and academic librarians are getting first-hand experience with GenY kids every day.) They do not recognize much, if any, “need” for library services, and seldom, if ever, seek “traditional” services from public libraries. All of the older generations will progressively have fewer consumers of fewer library services, whereas the future belongs to the young. It is understood that Millennials are into email, texting, IMing, Flickr, YouTube, Facebook, MySpace, Twitter, and whatever the latest electronic means of communication happens to be. They communicate using social media technology, and everything is “remote”. They generally only visit the library to collaborate and socialize. They have integrated technology into their life and it is now a necessity for them, because they grew up with technology and the Internet, and are “Digital Natives”. 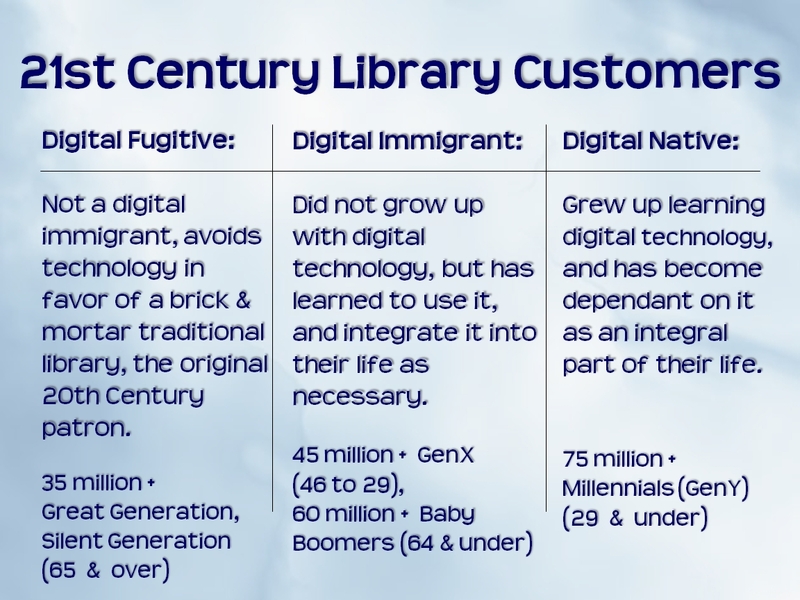 The successful 21st Century Library will provide services to their 21st Century Millennial Customer, because they know who they are and what they want. The 21st Century customer is NOT the 20th Century patron. Change Is Not Coming – IT’S HERE! Two significant events occurred already in this new year that demonstrate that change is no longer just coming – IT’S HERE!! When the ball dropped in Times Square, the Baby Boomer Generation began a flood of Americans turning 65 – officially seniors. Goldman Sachs invested $450 million in Facebook – establishing 2011 as the year of “Social Networking”. This is the year that those born in 1946 – Baby Boomers – begin turning 65. They become eligible for Medicare, full Social Security retirement benefits in 2012 (for those not already drawing their benefits), and all the rights and lower prices to which their advanced age entitle them. Additionally Boomers will continue to run the majority of the United States government and business. The last three Presidents are/were Boomers, and most Fortune 500 corporate CEO’s are Boomers. The four generations in the workplace that Jason Dorsey describes will continue for another 20 years at least as Boomers continue to age. In investing $450 million in the social networking giant, Goldman has established itself as the leading candidate to win the lucrative and prestigious assignment of Facebook’s initial public offering, whenever that day comes. It also positions itself to reap millions of dollars in banking fees. Goldman has already begun the process of wooing its wealthy clients to invest alongside it in Facebook, forming an investment vehicle that seeks to raise as much $1.5 billion for the Internet company. … an initial public offering of Facebook, [holds] billions of dollars of unlocked paper wealth realized by Mark Zuckerberg, Facebook’s 26-year-old chief, and his fellow executives. Goldman, as a lead Facebook investor, will most likely have a leg up in winning the assignment to manage that money, too. The firm’s Facebook investment came together over the last month, according to a person involved in the deal who spoke only on the condition of anonymity. After the spike in trading in Facebook over the last several months — in a November auction, Facebook shares traded at a $56 billion valuation — Mr. Zuckerberg expressed an interest in raising money to legitimize the $50 billion valuation. Mr. Zuckerberg felt that gaining the imprimatur of a major investor at such lofty levels would validate Facebook in the eyes of its Silicon Valley competitors with whom it is negotiating deals, this person said. Suffice it to say that Facebook will continue to succeed. As further evidence that 2011 is the year of Social Networking, Harrisburg University released the results from its “Black Out” study conducted last September. During the week of September 13 -17, 2010, Harrisburg University of Science and Technology blocked access over its network to several popular social media sites including, Facebook, MySpace, Twitter, and LinkedIn. Additionally, access to all instant messaging services was blocked. The blackout affected all students, faculty and staff at the University. The intent of the social media blackout was to raise awareness about uses and/or abuses of social media. An initial survey was completed on the first day of the blackout, and a follow-up survey was completed during the week following the blackout. In addition, multiple focus group sessions were conducted with students and faculty in the middle of the blackout week. These sessions were intended to gather richer, more detailed data than could be collected by survey instruments. Finally, individual emails and one-on-one conversations with students provided anecdotal and often humorous stories about their reactions to the blackout. One-quarter of the students and 40% of the faculty and staff at Harrisburg University responded to the surveys. The survey revealed that the majority of students, faculty and staff are regular users of social media. In fact, many are heavy users of various social media outlets. Specifically, two-thirds of the sample reported using Facebook on a daily basis, while 10% said they use Twitter on a daily basis. Among Facebook users, 25% cited mainly “social” purposes, including contact with friends, as the primary reason for using the site. Students and staff also use social media for “entertainment.” In fact, 13% of student responders said they rely on Facebook to combat boredom between classes. Exactly half of student responses cited the use of YouTube regularly for “academic and social purposes.” Instant messaging is also used by a large segment of the student body, with 35% usage among this sample. One question that is routinely debated is whether people can become addicted to social networking. The results from our survey suggest that this is possible. Specifically, it is remarkable to note that 40% of the student respondents spend between 11 and 20 hours a day using social media sites. One has to believe that this level of usage would likely interfere with school work and jobs. Further, it is somewhat disturbing to note that several faculty and staff reported spending more than 20 hours a day on social networking sites. It can easily be argued that social networking is NOT a fad that will disappear any time soon. Which means, libraries should explore applications of social networking in their library services. CHANGE IS HERE! ARE YOU READY? PS: Happy New Year, and Thanks for coming back! Change is Here – NOW! Remember the old saying, “The only constant is change.”? Well, it’s true – AND change is here – NOW! In case you haven’t stopped to look around, the impact of mobile communications technology is everywhere. Seriously! Most notably mobile technology change is evident in television entertainment. This past week I noticed (hard telling how many I don’t notice any more) three instances of technology change in TV programs we watch. The most memorable was a 30-min sitcom where one colleague was telling another that they learned something from a podcast. Have you ever heard the word “podcast” used in a sitcom? Seriously! To reinforce that change is here – now, this past weekend while in the mall it struck me that virtually everywhere I looked I saw people using mobile devices. In the mall restroom waiting area were four nice easy chairs arranged around a circular place rug and coffee table, even end tables for packages, and in every chair was someone using a mobile device. There was a 50-something man texting to someone (probably his wife wanting to know where he was), two tweens also texting to someone, and a Gen Y man using his iPad to browse whatever. (Why is it that more men sit in malls than women?) Of the young people I noticed navigating through the mall, at least 50% were actively texting. Have you noticed how many cell service provider kiosks there are in the malls? I saw one from every service provider I’ve ever heard of. (I should spend a day and visit each one to find out what they are offering for smartphones and service.) I did not see anything advertising, or reminding customers of their library, or even a book drop. Point being – when something finds its way into TV entertainment – IT IS IN! Mobile communications technology is definitely in! Will libraries be the laggards – the last to adopt it? Let’s hope not.